We are glad to release another unearthed ep ‘Azure Beyond’ by Lingua Fungi. This ep was recorded originally in 2011 and is now released through our Underworld Editions. It offers a glimpse into a more tranquil and minimalistic facet of Lingua Fungi. Two-piece composition performed with zither, harmonium and bells, ‘Azure Beyond’ is a slowly evolving and organic drone painting of the mind and matter diminishing in to a single point in an azure infinity – a gravitational collapse in an ever-expanding vastness. 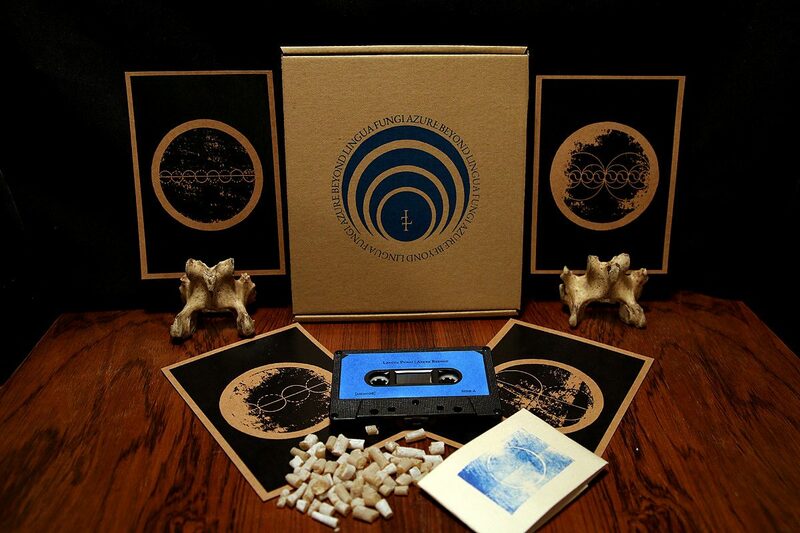 The cassette is housed inside oversized, silk-screen printed cardboard covers including five insert cards and a pack of incense (15g) created especially for this release by Mount Hypnox. Limited to 133 copies.